A Custom Indicator is a technical indicator written in addition to those integrated into the client terminal. It can be based on prices and volume, built-in technical indicators or other Custom Indicators. Custom Indicators are stored in experts\indicators subdirectory of the terminal directory (e.g. C:\Program Files\MetaTrader 4\experts\indicators). Custom Indicators are the great extension of MetaTrader terminal. Due to their flexible construction it is possible to build almost every type of indicator. Variety of Custom Indicators can be really vast, ranging from replacements for moving averages like Modified Optimum Elliptic Filter (MOEF), to signal indicators. The latter aggregate other indicators and are able to draw arrows, play sounds, send e-mails, etc. Example above shows the signal indicator which uses 3 EMAs (each item being displayed in the chart). All three periods of EMAs can be changed. In this particular chart we choose periods 8, 21 and 88. 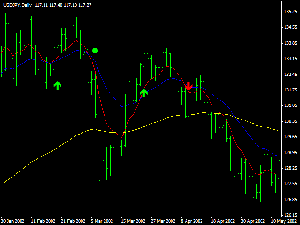 A buy signal (green upward arrow) is generated when the first EMA crosses up the second EMA and the third EMA rises. Analogically, a sell signal (red downward arrow) is generated when the first EMA crosses down the second EMA and the third EMA falls. Opening a long position means closing a short one and vice versa. The big green dot in the chart stands for a closure of a long position signal without opening a short one. Signal indicators can be more complex; they can be built on the top of other Custom Indicators as well.